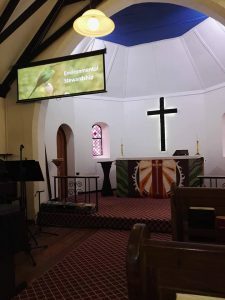 On the 30th September 2018, St. Paul’s United in the small “green village “called Haenertsberg celebrated the Season of Creation under the theme “Environmental Stewardship”. This congregation is a United church consisting of Anglicans, Methodists, Presbyterian and Baptists. They worship together as they form one body of Christ. The as the service began the minister-in charge Fr. Jonathan Meintjes declared that the service will be dedicated to the environment. Makwetša Ramusi was then called to talk to the congregation of St. Paul’s. He mentioned that we all have ability to be change makers, and that we have to be a source of education to the world. Especially about the misuse of plastic. In Father Jonathan’s sermon (Genesis 1: 21-2:15) , he preached about we as the people being the servants of the environment. We should be the ones who implement the change within the environment we live in. He then mentioned that we are the ones whom are capable of taking care of our children’s legacy, which is taking care of the environment.